Started as an idea around 2006 when Nick Armstrong, John Abbott and Jessica Young were on a JTS Brown team called NiteTerrors coached by Craig Cackowski. Improv Utopia didn’t come to fruition until 2011, when Nick approached John, Jessica, Brian O’Connell and Patricia Forman to start what would be a Boy/Girl Scout Camp meets Improv. In 2011, Camp Improv Utopia launched to a sold out group featuring theaters from all over the country. Camp West is held at Camp Ocean Pines in Cambria, CA and still is to this day. 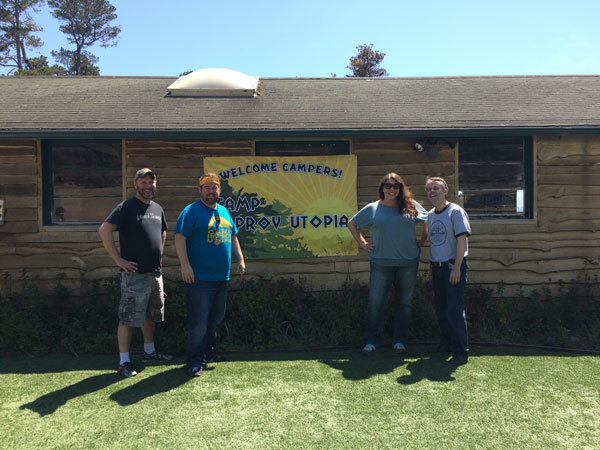 In 2014, Camp Improv Utopia East was launched, therefore changing the camp in Cambria to Camp Improv Utopia West starting in 2015. Camp East was held at Camp Netimus in Milford, Pennsylvania in the Poconos in 2014 and 2015 and added a new Assistant Camp Director and board member Chris Moody from Detroit. Camp East’s first year was also sold out and featured campers from the all over the world. In 2016, CIU East moved to the beautiful Camp Trout Lake in Stroudsburg, PA in the Pocono Mountains were it is currently. In 2016, Camp Improv Utopia Yosemite launched it’s first camp which also sold out. CIU Yosemite is a whole new curriculum where you get one instructor the entire weekend and study a form they are a master of. Camp Yosemite is held at Calvin Crest in Oakhurst, CA. In 2018, we launched our international improv retreat in Ireland and immediately sold out. IU Ireland takes place in Newgrange Co. Meath in Ireland. Our professional staff and board members are made up of some of the best improv talent in world. We are available to you as a resource and also to help plan your trip to our annual camp. Improv Utopia is a 501(c)(3) Non-Profit Organization and a majority of our profits go back into the improv world for Improv Scholarships, theater and festival support. Improv Utopia unites the improv community together. Through our educational camps, workshops and social media, we provide help to improv students, theater venues, festivals, improv and art related causes to grow through our educational and financial resources and succeed. Our promise is to give back to the arts community and forward the advancement of improv as an artform. Looking to see who is behind the scenes of Improv Utopia? Click on the button to meet our amazing staff and learn more about how they got started.